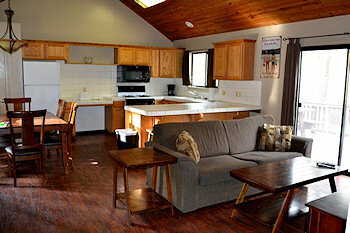 These cabins are our largest cabins with two bedrooms downstairs. There are two full bathrooms and a full-size kitchen. These cabins come with all dishes, pots and pans, linens, towels, a microwave, coffeemaker, blender, toaster, barbeque and satellite television. Premier cabins also have air conditioning. 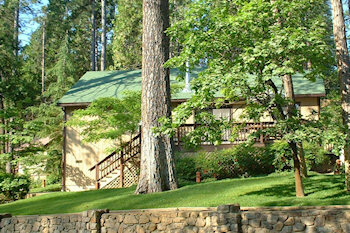 All of our cabins are located in a natural forest setting of majestic pine trees that cascade their way to the beautiful waters of Bass Lake. Interiors vary depending on the renter's taste. Many feature fireplaces, dishwashers, cable television and much more. Campfires in the evening will renew your childhood memories and perhaps create new ones for those who have never experienced the peace and tranquility of sitting by a glowing fire.